Five years ago, I was introduced to Homemade Laundry Detergent. When I saw the savings and how easy it was to make, I was sold! For the last 4 1/2 years I have used my version of powder detergent. Recently, my elderly neighbor shared a liquid recipe with me. She make and preserves everything! (She even cans flour. Who knew?) I realized with her years of experience this recipe would be a winner. 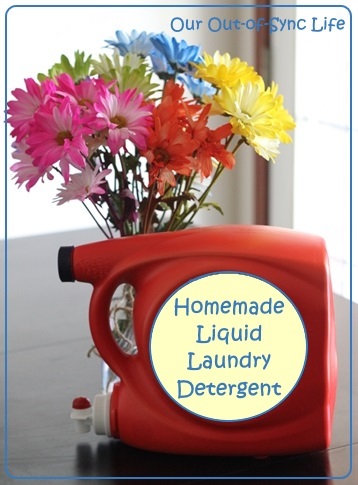 Plus this recipe dates back way before making homemade detergent was cool! Many of the ingredients are the same from the powder to the liquid, so I had the supplies on hand to quickly mix up a batch. Notice the word quickly. 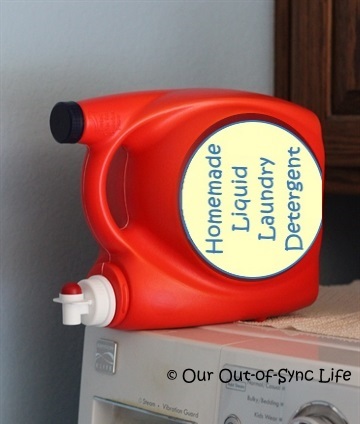 Unlike many of the liquid laundry detergent recipes that I have seen, this one requires no heating to thicken! Also, it doesn’t have to sit for several days. Just combine and use! Doesn’t get any easier than that. 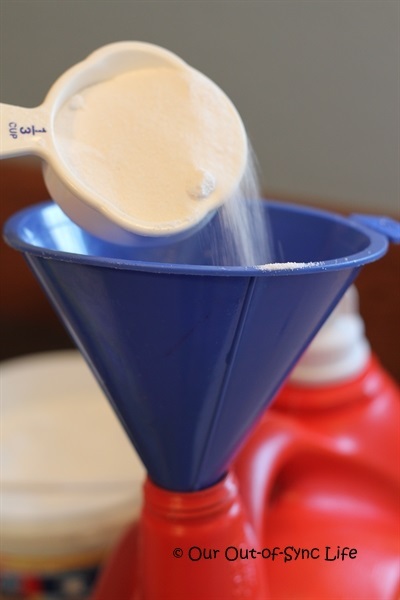 Regular baking soda is not a substitute for washing soda (talk to a chemist on why this is). Originally I had trouble finding washing soda so I called the Arm and Hammer corporation to find a place locally that sold it. Five years later and our local Walmart carries it. Of course you can also order it online. Oxiclean is not part of the original recipe. I just like the stuff! Pour the dry ingredients into a gallon-sized container. Add enough hot water to almost fill the container. Add the Dawn dish soap. If you add the Dawn before the water, you will have a foamy mess. Return the lid and shake well. That’s it! No heating or waiting required. Since I have a front loading washing machine, the recycled Tide container sits on top of the machine. Don’t be alarmed the first time you use this detergent. It is the consistency of water. But, if you dip your finger into the liquid, you will find it is very soapy. 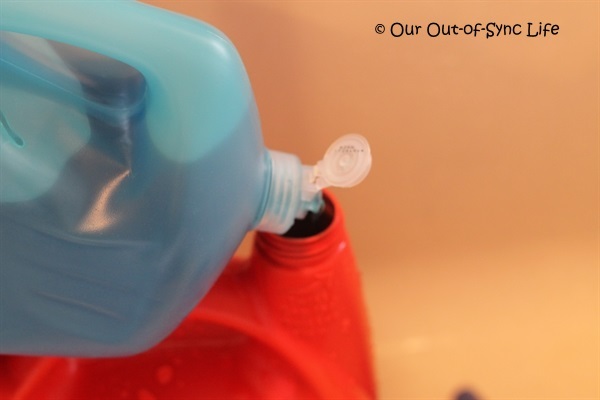 I simply squirt enough detergent to fill the dispenser – about 1/2 cup. 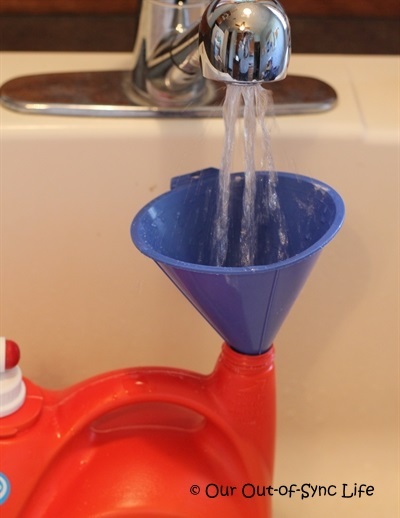 Since the detergent is highly liquid, it requires more than the condensed versions. I will be honest, I haven’t priced out this recipe. I can tell you it would be pennies per load (cheaper if you don’t add the Oxiclean). Much, much cheaper than what you pay in the stores. There you have it! 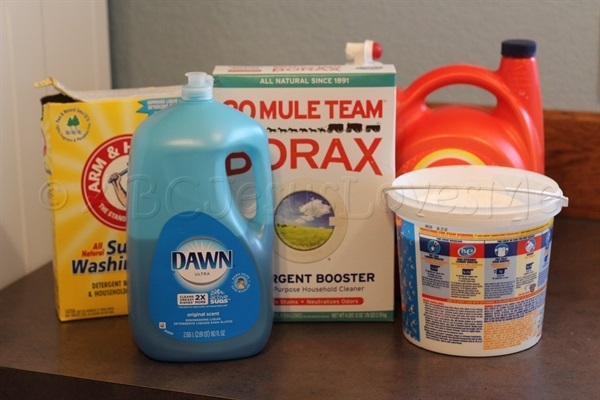 I have now shown you how to Tame the Laundry Giant and now two different laundry detergent recipes to help the budget – both liquid and powder. I hope all these tips and recipes will help your family as much it they have ours! Oh…and be sure to share your tips and recipes in the comments below so we can learn together! I haven't ever canned flour but my neighbor told me all about it! Guess if you found flour on sale this would be one way to store it! Is the liquid detergent okay in HE washers? I use it in my HE washer and haven’t had any issue. But check your owner’s manual for sure.